The Methods of how to gain a vision of Sayyiduna Muhammad Sallallahu Alayhi Wasallam are from Imam Yusuf al-Nabahani’s, may Allah be pleased with him, monumental Sa‘adat al-darayn fi al-salat ‘ala Sayyid al-kawnayn (Felicity in the Two Abodes Through Prayers upon the Master of the Two Realms – may Allah bless him and grant him peace), details forty (40) tried and true methods for seeing the Prophet Muhammad, may Allah bless him and grant him peace, in a dream gleaned from the works of the early and later spiritual master. subhanAllah salallah tala hu alayhi wasalam the same thing happened alhamdulillah! May Almighty Allah bless your efforts, and fill the hearts of Muslims with the Mahabbah of His Beloved. Ameen. keep us in your blessed duas shaykh. Ive been trying to write to ask a couple questions. I live in Binghamton new york. Ive asked the mosque around here but as you have stated in many lectures ive listened to some people have knowledge with little wisdom. Im not saying nothing bad about none may Allah forgive me. I was wondering if I can ask you questions I have and I trust your answers. InshaAllah ill hear from you. Walaykum Salam Wa Rahmatullahi Wa Baraktuh Sidi , please ask any questions and we will answer them InshahAllah ! Allah Humma Ameen SallAllah Hu Ala Nabi al Muhammad SalAlllah Hu Alaihi Wasalam! It is with reticence that I write this. I do not wish to place myself on the moral high ground, or to sermonise anyone. This chapter tries to show the truth and importance of dreaming of our Holy Prophet Muhammad . These words seek to confirm that ours is a Prophet of Mercy, a Witness, and a Bearer of Good Tidings. It also aims to portray the consequence of da’wāt in the Masjid al-Harām. It is moreover meant as a method and encouragement for our children to pursue the Countenance of God Most High and to some day, continue with the Prophetic Tradition of raising an orphan for the sake of Allāh, The One of Unbounded Grace. So that they may by this means know that there is more to life than just prayer and fasting. And that they should give of themselves unreservedly. That they might through it also, temper their adhkār with compassion. We were asleep at the Mashrabiyya Hotel in Khālid bin Walīd Street in Shubayka, Makkah al-Mukarramah when, by the Mercy of Allāh, I had the most beautiful dream. I saw myself standing in the holy presence of our Truthful Prophet Muhammad . The appearance of the Holy Messenger of Allāh matched scriptural records. Our Prophet was spotlessly dressed in white robes and a white turban. I stared aghast. Our Prophet stood about two metres away and faced me directly. Someone so unimaginably holy, so indescribably handsome, one will not come across. I do not have the words with which to suitably portray this most wonderful man, the Seal of the Prophets . I reached for my turban, embarrassed for having only a skullcap on my head. I had, through carelessness earlier in the day, joined the multitude in the Grand Mosque for the mandatory prayer wearing a skullcap, but no turban! Brilliance shone from our Guided Prophet . Our Prophet smiled at me. His smile radiated light. I stood alert, too humbled to speak. Smiling back would have been too audacious. I wished that the dream would last forever. The heavenly smile lasted between ten and fifteen minutes, it felt like. Al-Hamdu Lillāh. I had never considered myself deserving of such an enormous honour. This was a spiritual experience of the first magnitude. “What does that smile mean?” I wondered. “Why is our Heroic Prophet Muhammad so extremely pleased?” I asked myself over and over again. I stared at the House of Allāh for extended periods, contemplating its meaning. Deep in thought, I barely noticed the usually persuasive central-African women selling birdseed in small plastic bags as I walked back and forth from the Masjid al-Harām. I was hardly aware of the Turkish female who was dealing in steel daggers on the side of the street. Two men earnestly collecting on behalf of Bosnian refugees also failed to draw my attention. I half-heard a Pakistani lad calling out the price of bottled perfume to prospective customers alongside the road. Malaysian girls trading informally with scarves only just caught my eye. Part of the street had been freshly tarred. “Unless you receive the sort of treatment that a host bestows on a guest, don’t ever think that, because you have performed the ziyārah of the Baitullāh, you’ve been the guest of Allāh,” my father had once counselled me. I considered his observation a bit harsh then, but the force of his remark was now bearing home on me. He knew what he was talking about. “’Ammie Haji” had taught the Hajj for more than fifty years and had been to Mecca many times. Ihsān comes easily to someone who gets beautiful spiritual experiences. For him it had happened very quickly. Aged twenty-six on his first Hajj in 1949, Haji Suleiman had landed inside the Holy Ka’abah when someone lifted him head-high and tossed him over the 2.25 metre high threshold of the Baitullāh. “Did you not get hurt?” I inquired further. “No!” he responded excitedly. “I was young and fit, and had landed on my feet,” he continued proudly. Not just anyone was allowed into the Holy Ka’abah. Once over the doorsill, he did not have too far to fall, as the inside floor was 2.2 metres above the ground. ’Ammie Haji performed two cycles of discretionary salawāt once inside. From then on, he would wonder who had done him the good turn. A number of Muslims before our time had believed that someone who had been inside the House of Allāh would not return home. Such was ‘God’s Will’, they had resolved resignedly. ’Ammie Haji chuckled as he recalled years later how the neighbours in Salt River, on learning of the incident, came to commiserate with his mother on his impending death in Mecca. Every Muslim who had walked on the holy soil had the potential for such an experience, I realised. Such incidents might have been more prevalent than was ordinarily heard of, I thought. “You don’t tell just anybody about this sort of thing,” some said “as your sanity could be questioned.” I had for a long time suspected that at least some pilgrims who repeatedly visited the Holy Land, apart from drawing from its built-in holiness, did not preclude themselves from offerings of this nature. It would be silly to think that parallels could not be drawn with al-Madīnah al-Munawwarah in occurrences of this kind. Thinking that this sort of happening was in any way unique to myself, was ludicrous. It would also have been reasonable to expect wondrous incidents of this nature to occur in Jerusalem, as the major Middle Eastern religions agreed on the sanctity of this, the City of the Farthest Mosque. Allāh Had Taken our Reflective Prophet Muhammad on a journey by night from Al-Masjid Al-Harām to Al-Masjid Al-Aqsā in Jerusalem, and the heavens. To Muslims, Al-Aqsā Masjid was the First of the Two Directions of the Formal Prayer. Part of my da’wāt in the Holy Mosque in Mecca, was to ask Allāh, The One Who Makes Clear to us His Signs so that we may be grateful, to Grant to ourselves the opportunity and blessings of raising an orphan for His sake. Having the money with which to afford to go on Hajj has always been its first consideration. There were many people who had performed the Holy Pilgrimage more often than I. With regard to my parting from the Holy City, though, I had received a fascinating send-off. In an interview and in response to a question on whether we would mind adopting a child from a ‘lower rung’ of the colour scale, I told them that “a nice green one” would do. Race inequalities existing at the time ensured that hundreds of black orphans went begging in more ways than one. It virtually excluded us from adopting a child. No orphans that matched our race and blood mix were on offer and they weren’t likely to easily present themselves for adoption. My wife is of Indian (as in “Indian” from India, as opposed to “American” Indian) stock and I am of well-mixed blood. On the morning of Wednesday, 1st June 1994, just three days after arriving back home from Hajj, we received a telephone call from Melanie Van Emmenes of the Child Welfare Society. She explained that a five-month old girl had come up for adoption. The baby had earlier undergone successful abdominal surgery and she asked whether we would adopt the child. We jumped at the chance. Afterwards, we told our children that we were about to receive an addition to the family. Rifdah, the youngest, had started primary school at Habibia. We plodded through a maze of red tape in order to legalise the adoption process. (My wife and I had to marry in court because Muslim marriages were not recognised then, believe it or not). A few days later, my wife, brother and I collected the petite infant from a foster-mother in Newfields Estate. I shall never forget the joyous feeling when I first carried the frail waif past the front door. Her name is Makkia. We named her after the great city from which we had just returned. Taking her into our modest home is one of the better things that we have done. Her growing up with the other children has made matters easy. Rashieda being a housewife helped. Makkia has added a marvellous dimension to our lives. She is part of our life’s-work. I shall always be grateful to the people who had assisted us with the adoption. In a letter of recommendation to the social workers, Haji Achmat Lalkhen al-Qādirī al-Chishtī wrote that he could vouch for my decent parents. Sheikh Mogammad Riefaard bin Moegsien Manie al-’Alawī al-Qādirī al-Chishtī had stated as a character reference that I was ‘of sober habits’. Raising an orphan means giving from the innermost recesses of one’s heart. “There should be no orphanages within our community, as we should look after helpless children,” is a common refrain amongst local Muslims. Every orphanage is an indictment on Muslim society and a blight against our culture. Adoption is a superb act of charity and the most effective form of da’wah. Not everyone is big-hearted enough to raise someone else’s child. If every able married couple took in an orphan, the world would be a better place. The number of abortions due to unwanted pregnancies would perhaps decrease if affected pregnant women were assured of good adoptive homes for their babies. Couples with an adopted child will think twice before they consider divorce. Adoption springs from the soul of the adoptive parent. We cry when a child is orphaned. The inhabitants of heaven cry more. The meaning behind the glowing smile from our Trustworthy Prophet Muhammad had played itself out in the most delightful way. My dream shows our Prophet’s level of awareness and highlights his profound love for orphans and how kindly he looks on raising an orphan. It demonstrates that raising an orphan is an immensity before God. In our Prophet we have a beautiful pattern of conduct. Our Affectionate Prophet Muhammad , also, had raised a destitute child. Our Divinely-inspired Prophet is the first of the God-fearing. No person is better than him. He had scaled the peak of human tenderness and is without sin. Our Faultless Prophet is the foremost of those who submit to the Will of Allāh. An exemplar to those who worship God, our Kind-hearted Prophet Muhammad is the beacon of the pious. Religion is a feature that has encompassed all cultures throughout history. He had brought a religion of kindness and peaceful coexistence. 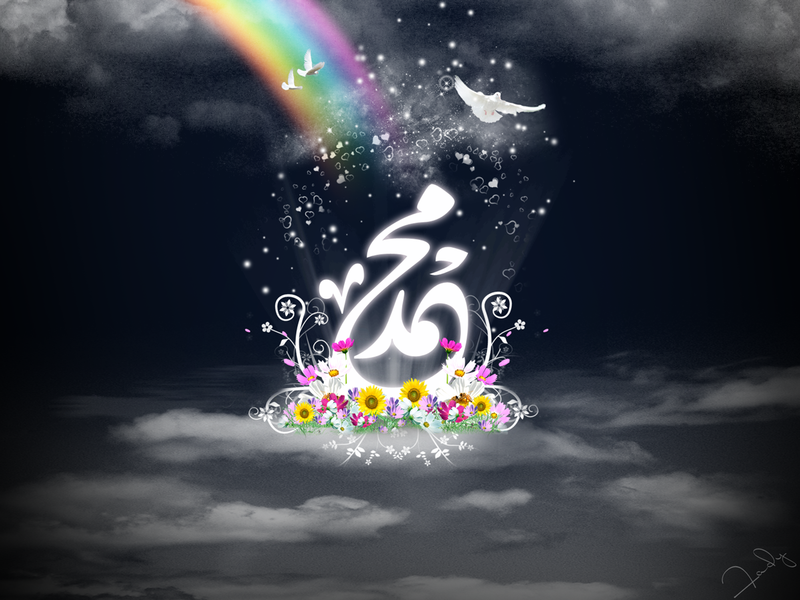 Sent by God with an easy and straightforward religion, our Prophet Muhammad is the leader of the prophets. Like a lamp that spreads light, the Messenger of Allāh invites to the Grace of Allāh by His leave. Allāh, The One Who Built over us the seven firmaments, Had Entrusted him with all the people of the earth. He is an inspiration to those who are thankful to God and the leader of those who remember Allāh . How should I express gratitude to the Holy Messenger of Allāh for his kind intervention? I am unworthy of untying the thongs of our Prophet’s sandals. ’Abd Allāh b. ’Amr reported the Prophet (May Peace Be upon him) as saying: The Compassionate One Has Mercy on those who are merciful. If you show mercy to those who are on the earth, He Who Is in the heaven Will Show Mercy to you. Narrated Jarīr bin `Abdullāh : The Prophet said, “He who is not merciful to others, will not be treated mercifully. Jarīr reported from Allāh’s Messenger (May Peace Be Upon him): He who is deprived of tenderly feelings is in fact deprived of good. ’Ā-ishah (Allāh Be Pleased with her) has reported that the Holy Prophet (Peace and Blessings of Allāh Be Upon him) said: Allāh is kind and loves kindness in all affairs. Anas has said: The Messenger of Allah (May Allah Send Salutations upon him) was the most merciful to the needy. Jarīr b. ‘Abdullah said: Allāh’s Messenger (May Peace Be Upon him) never refused me permission to see him since I embraced Islam and never looked at me but with a smile. Narrated Sahl : Allāh’s Apostle said, “I and the one who looks after an orphan will be like this in Paradise,” showing his middle and index fingers and separating them. Narrated Sahl bin Sa’d : The Prophet said, “I and the person who looks after an orphan and provides for him, will be in Paradise like this,” putting his index and middle fingers together. Sahl (b. Sa’d) reported the Prophet (May Peace Be upon him) as saying: I and the one who takes the responsibility of an orphan will be in Paradise thus, and he joined his middle finger and forefinger. Sayyidina Sahl ibn Sa’d reported that Allah’s Messenger said, “I and the guardian of an orphan will be in paradise like this,” and he gestured with his two fingers, the index finger and the middle finger. … Abū Huraira reported that the Prophet of Allāh, upon him be peace, said, “The best home among the Muslims is the one that treats an orphan well. The worst home among Muslims is the one that treats an orphan poorly. I and the one who cares for an orphan will be like these two in Paradise.” The Prophet indicated his two fingers. Abū Huraira reported that Allāh’s Messenger said, “One who looks after the orphan whether he is his relative or not, I and he will be together in Paradise like this,” and Mālik (explained it) with the gesture by drawing his index finger and middle finger close together. Safwān ibn Sulaim learnt that the Apostle of Allāh (May Peace Be upon him) said: I and the one who brought up an orphan, whether he be his relation or not, would be like these two fingers in Heaven when he acts piously. He pointed to his fore and middle fingers. Jābir reported Allāh’s Messenger (May Peace Be Upon him) as saying: Food for one (person) suffices two, and food for two (persons) suffices four persons, and food for four persons suffices eight persons. Mālik reported Allāh’s Messenger (May Peace Be Upon him) as saying: He who brought up two girls properly till they grew up, he and I would come (together) (very closely) on the Day of Resurrection, and he interlaced his fingers (for explaining the point of nearness between him and that person). Sayyidina Anas ibn Maalik reported that Allah’s Messenger said, “As for him who sustains two girls, I and he will enter paradise like these two,” and he gestured with two fingers (the index and [the] next fingers). May Allāh, The One Who Befriends the righteous, Send His Richest Peace and Blessings Upon our Holy Prophet Muhammad and on his family and companions, as much and as often as Allāh Wills. Allāh, The One Who Is Sufficient For those who put their trust in Him, Had Accepted our prayers and Granted our want through the barakah of our Beloved Prophet Muhammad . I’ve been fairly constant about wearing a turban during ’ibādāt since. Salam alikum, I am from Australia and really want to buy this book. Can some one guide me where can I buy it from. I can pay via paypal only. Jazak Allah!